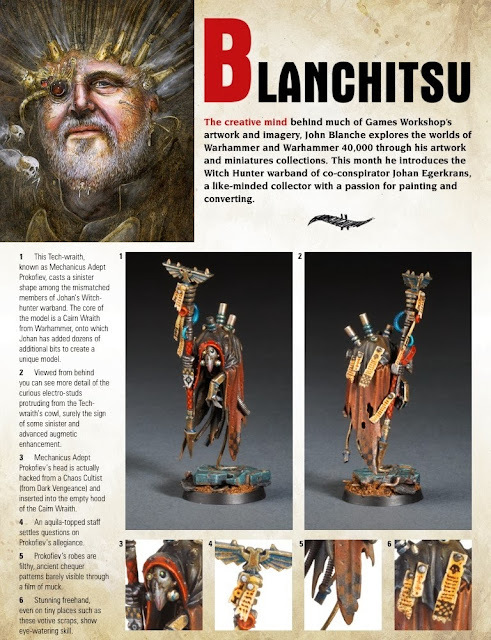 It's been a long wait (I've been keeping the articles existance to myself for half a year) but in this month's White Dwarf, John Blanche's column "Blanchitsu" focuses on my creations. Not only is getting my minis featured in WD a childhood's dream come true, but on top of that John's also written a very heartwarming introduction. Thank you so much for this John. I'd also like to thank Peter Hudson/PDH for bringing the minis to GW HQ and a for his splendid repair job on Prokofiev (who lost some of his studs while in the hands of the postal service). Congratulations Jeff. I was very happy when I picked up my copy this morning and saw you featured in my favourite article. Wow! My most sincere congratulations! It is more than deserved indeed! Congrats! I thought I recognised them from somewhere. Nice job. Looks like I am going to have to buy the White Dwarf magazine! Great work, it never ceases to amaze me! Eye watering skill indeed. A worthy mention sir, well done! Many congratulations!!! I have yet to crack open my digital copy yet, but it's always the first article I read. Well done!! Thank you all. Great start of the new year! Congratulations, and well deserved indeed. Congratulations Jeff, more than well deserved spotlight there!